Symptom: (see photo 1 below) Initial symptoms consist of leaf spots which often form along the mid-vein. 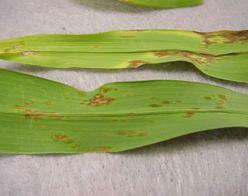 These spots often have an orange coloration, leading people to suspect daylily rust. These are more angular and elongated than those formed by rust. When spots coalesce, extensive necrotic areas develop and the tissue surrounding this becomes chlorotic. Leaf dieback symptoms follow and usually develop from the leaf tip downward. 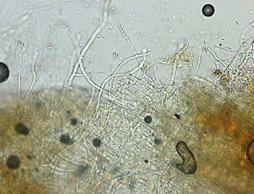 Spores, which cause additional infections, are produced in the necrotic tissue. Heavily infected leaves often wither and die. Pathogen cycle: The fungus (see photo 2 above) persists through the winter within dead leaf tissue. In the spring or summer, with the return of favorable conditions, spores are again produced and provide the source for initial infections. Disease development is dependent on moisture supply and temperature. When temperatures are above 90F, disease development slows. Rainy periods and overhead irrigation increase infection and enhance symptom development, since spore dissemination occurs naturally by splashing water. Plant to plant spread can also occur when people or animals move through wet foliage. Management: Wider spacing of plants to increase air circulation and management of overhead irrigation will aid in control by allowing leaves to dry. Remove and destroy dead leaves after the first hard freeze. Avoid purchasing plants with any symptoms of the disease. Varieties vary markedly in their resistance. Resistant varieties include: Betty Bennet, Edna Spalding, Ella Pettigrew, Globe Trotter, Nancy Hicks, Pink Superior, Ron Rousseau, Sudie, Tropical Tones, Upper Room, and Winsome Lady. Races of the pathogen exist; therefore, disease may still occur on these varieties. It is important to start sprays at emergence of new growth. Make 3-4 applications at 2-wk intervals. If sprays are not initiated until first sign of disease, continue sprays at 2-wk intervals through bloom. The 2006 Georgia Pest Management Handbook lists Daconil 2787 and Daconil Ultrex. Daconil 2787 can be used by home gardeners. The 2006 North Carolina Agricultural Chemicals Handbook also lists mancozeb and thiophanate-methyl products. There are formulations of these products and/or active ingredients registered for use in South Carolina.